The anthology app is free for for iPad, iPhone and iPod touch, and was created using the same engine as Dave Morris’ Frankenstein. In 2012 we held a competition for writers to create short interactive fiction using inklewriter. The best ten stories to be selected by an industry panel of judges and turned into an app, Future Voices. The eleven published stories are a wide-ranging mix, from writers of all ages and from all around the world. There is madcap comedy, ethical dilemmas, ghosts and spacemen. Some are beautifully written with light interactivity, while others are puzzles or small adventures. Our judges were: Alexis Kennedy of Failbetter Games, Michael Bhaskar of Profile Books, literary agent Piers Blofeld of Sheil Land Associates and Anna Faherty of Kingston University. 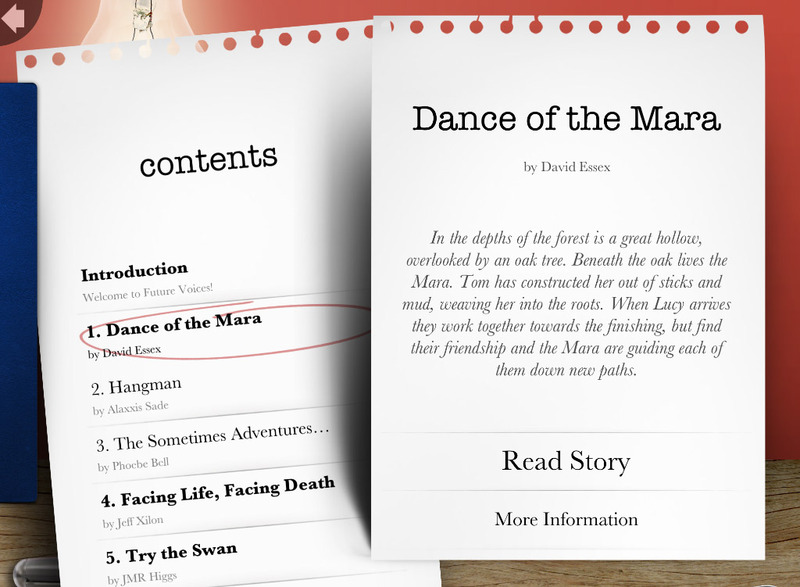 inklewriter is a free site that lets anyone create and share their own interactive stories. Half a year since it’s release, it’s seen well over 7,000 stories created, and some of the most popular have been viewed more than 20,000 times. It’s being used by teachers in the classroom, by authors wanting to publish interactive stories on Kindle, by game developers and designers, and it’s also been used to classify insects.